Coal and charcoal are carbon-containing compounds. Coal is a sedimentary rock. It is primarily composed of carbon along with trace amounts of some other elements such as hydrogen, sulfur, and nitrogen. Charcoal, on the other hand, is an impure form of carbon that is obtained by partial burning of carbonaceous materials in the presence of limited oxygen. The main difference between coal and charcoal is that coal is a naturally occurring fossil fuel whereas charcoal is formed as a result of burning carbonaceous materials. Coal is a combustible black or dark brown rock consisting chiefly of carbonized plant matter, found mainly in underground seams (coal beds). It is a carbon-rich material. This compound occurs as a sedimentary rock. Coal is one of the most important fossil fuels used all around the world. Coal primarily consist of carbon along with some other elements such as hydrogen, sulfur and nitrogen in trace amounts. Coal is formed when dead animal and plant matter undergo biological and geological process over millions of years. Coal is obtained from the ground via coal mining. Coal is a good source of energy. Burning coal can be used to produce electricity and heat. Coal is also one of the major sources of carbon dioxide released to the environment; hence, it plays an important role regarding the global warming. There are different varieties of coal depending on different parameters. Followings are some examples. Coal is primarily used as a fuel to produce electricity and heat through combustion. The consumption of coal for this purpose is increasing year by year. For the generation of electricity, coal is first pulverized (reduced to fine particles) and then burned in a furnace. A boiler, which converts water into steam, is attached to this furnace. The heat produced by combustion of coal can boil water to produce steam. Steam is used to spin turbines to generate electricity. Another approach to generating electricity is by IGCC power plants (Integrated Gasification Combined Cycle power plants). Here, coal is gasified to create syngas (syngas is the short name for synthesis gas. It is a fuel gas mixture containing hydrogen, carbon monoxide like gases). This syngas is then burned in a gas turbine to generate electricity. This method does not require pulverization. Coalification is the process in which plant matter becomes converted into coal of increasingly higher rank with anthracite as the final product. The general sequence of coalification is as follows. Lignite is referred to as brown coal. It is considered as the lowest rank of coal. The properties of Subbituminous coal range from lignite to bituminous coal. Bituminous coal is also called black coal and is a good rank of coal. Anthracite is a hard, compact variety of coal that has a submetallic luster. It has the highest carbon content and lowest impurities. 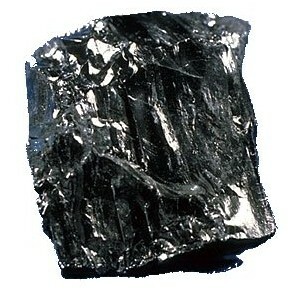 It is considered the best rank of coal. Duration is how much time it is taken to form coal. Since the natural coalification process takes a million years, the duration is undetermined. The temperature increases with depth from earth’s surface (increase by 30oC per kilometer). The pressure also increases with depth. Therefore, coalification is directly affected by temperature and pressure. Charcoal is a porous black solid, consisting of an amorphous form of carbon, obtained as a residue when wood, bone, or other organic matter is heated in the absence of air. Some common types of charcoal are as follows. The process of producing charcoal is known as slow pyrolysis. 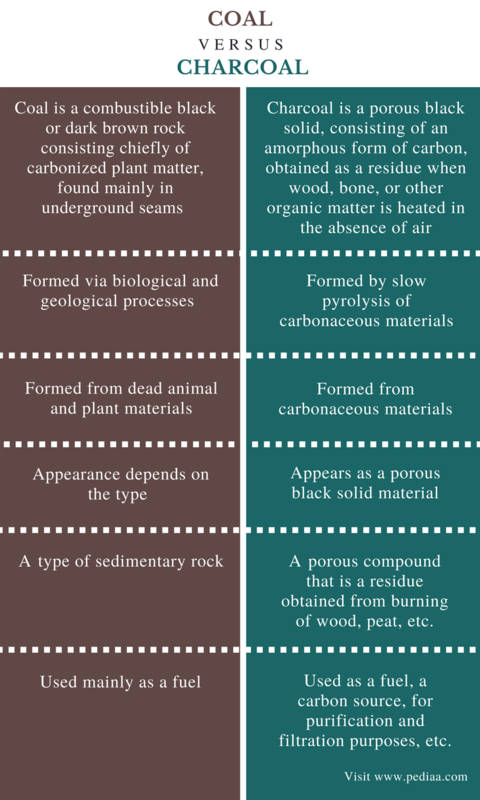 The production of charcoal is found mainly in two methods as follows. Older method of using a clamp. Here, a pile of wood logs leaning against a chimney is used. The wood logs are placed in a circle, and the logs are covered by soil to avoid air entering the pile. Then it is lit using a chimney. Logs burn slowly and turn into charcoal within few days. Modern method of charcoal production is retorting. Here, heat is recovered from and solely provided by the combustion of gas released during carbonization. There are few types of charcoal. 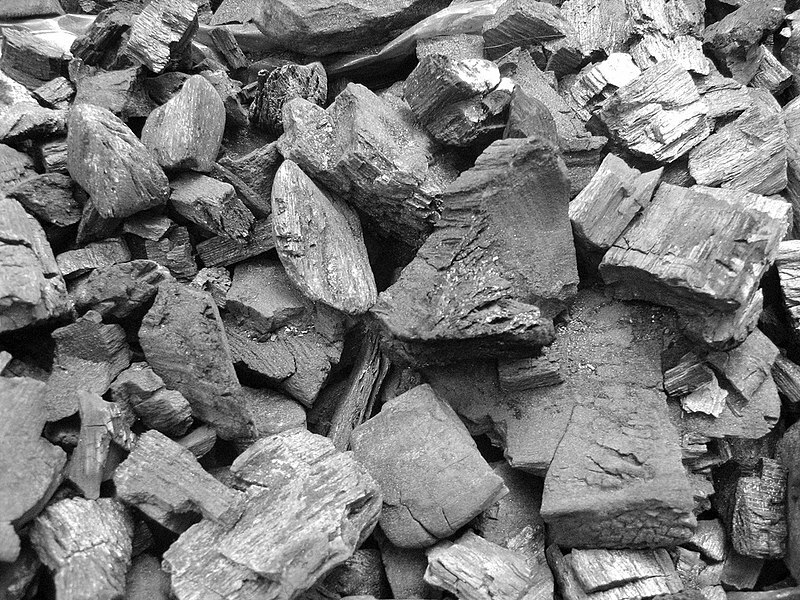 Common charcoal made from wood, peat, petroleum, etc. Sugar charcoal obtained from carbonization of sugar. Activated charcoal made by heating common charcoal in the presence of some gases that cause the formation of “pores” on the surfaces that cause adsorption. This type is made especially for medical and research uses. Lump charcoal is traditional charcoal made by burning hardwood material. There are many uses of charcoal. It is often used as a fuel. Charcoal is used by blacksmiths since charcoal burns at higher temperatures such as 2700oC. As an industrial fuel, charcoal is used for smelting of iron. A most common use of charcoal, especially activated charcoal, is its use for purification purposes. Activated charcoal readily adsorbs chemical compounds such as organic impurities. Charcoal can be also used as a source of carbon in chemical reactions. Coal: Coal is a combustible black or dark brown rock consisting chiefly of carbonized plant matter, found mainly in underground seams (coal beds). Charcoal: Charcoal is a porous black solid, consisting of an amorphous form of carbon, obtained as a residue when wood, bone, or other organic matter is heated in the absence of air. Coal: Coal is formed via biological and geological processes that animal and plant material undergo for millions of years. Charcoal: Charcoal is formed by slow pyrolysis of carbonaceous materials. Coal: Coal is formed from dead animal and plant materials. Charcoal: Charcoal is formed from carbonaceous materials. Coal: The appearance of coal depends on the type of coal; anthracite coal has a black, metallic luster whereas lignite coal has a brow, dull appearance. Charcoal: Charcoal appears as a porous black solid material. Coal: Coal is a type of sedimentary rock. Charcoal: Charcoal is a porous compound that is a residue obtained from burning of wood, peat, etc. Coal: Coal is used mainly as a fuel. Charcoal: Charcoal is used as a fuel, a carbon source, for purification and filtration purposes, etc. Coal and charcoal are carbon rich compounds. Coal is made as a result of biological and geological processes that animal and plant matter undergo for millions of years. Charcoal is a product obtained by slow pyrolysis of carbonaceous materials. The main difference between coal and charcoal is that coal is a naturally occurring fossil fuel whereas charcoal is formed as a result of the burning of carbonaceous materials. 1. Kopp, Otto C. “Coal.” Encyclopædia Britannica, Encyclopædia Britannica, inc., 23 Nov. 2017, Available here. 2. “Coal.” Wikipedia, Wikimedia Foundation, 20 Dec. 2017, Available here. 3. Goldwyn, Meathead. “The Science of Charcoal: How Charcoal is Made and How Charcoal Works.” Amazing Ribs, Available here. Madhusha is a BSc (Hons) graduate in the field of Biological Sciences and is currently pursuing for her Masters in Industrial and Environmental Chemistry. Her interest areas for writing and research include Biochemistry and Environmental Chemistry.